Dance, sweat and burn calories to the hottest beats in one of this year's biggest Zumba events! 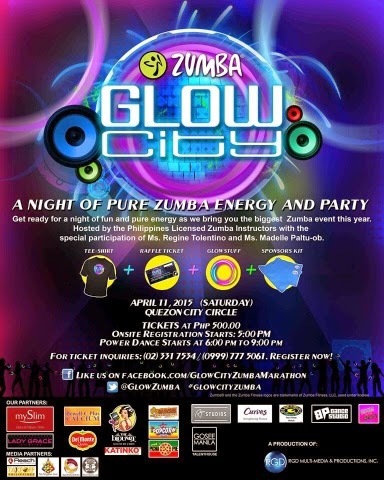 Join Zumba Queen, Regine Tolentino and Zin Instructors from different studios in a night of upbeat reverie at the Glow City Zumba Marathon to be held at the Quezon City Memorial Circle on April 11,2015. For Glow City's first leg, RGD Multi-Media & Productions, Inc. chose the Quezon City Memorial Circle as it's venue due to it's accesibility and for being a conducive location for fun and healthy physical activities.